On September 22,2018 at 10:05 I entered the Wascana office of Rotten Ralph Goodale. The Three Stooges were visible through three open doorways. To my left was Stooge #1 who looked like about a sixty-year-old grey-haired woman, occupied on her phone. Straight ahead was Stooge #2 who looked like a male in his thirties. With the Liberal policies it ‘male not have been male’. Whatever, critter #2 was also flapping their phony lips. I heard the voice of Stooge #3 to my right offering assistance. Now, this was an eye-pleasing, blonde haired stooge that I certainly hope for the sake of the heterosexual male was not just another Lizard Lesbian of no use to God or man. I entered ‘her’ office with my delivery materials in hand which consisted of my ministry business card and the two hand bills following. ‘Good morning’ I said to the smiling blonde face. 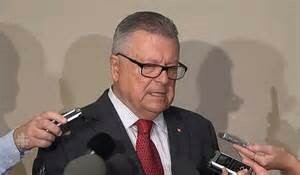 ‘I assume that Goodale is in Ottawa today.’ With reply in the affirmative I stated: “Whatever, I have come to give you formal notice that a group of us are preparing to take Rotten Ralph into Court. Please inform him of such.” With this I placed the following hand bills in front of her so she could see them. Her eyes lit on the Trudeau bill and she began to giggle uncontrollable, interjecting she would comply between giggles. She was still giggling as I exited the office. As to her sexuality? Well, I thought to myself, who knows. Even the Lesbians are known to giggle and many butch-dykes are starting to see Trudeau for the clown show he actually presents. I have heard rumors that some of them are getting ready to challenge him to a ‘boxing match’. If such an event occurs that should be the end of Baby T.
Who knows about the blonde giggler? Perhaps the heterosexual boys will find out when we get Rotten Ralph into Court. This entry was posted in Critters of Contempt by thinwahtruth. Bookmark the permalink.